This new model of Waldmann LED bench luminaires, the Taneo, combines LED technology with the reputable German designed and made arm assembly. The Taneo LED Bench Luminaire, an uncompromising lighting solution that is essential wherever your eyes are put to the test. Whether in manufacture, assembly, quality assurance or analysis, whether in labs, or the electronic, metal or watch industries – TANEO is a truly universal talent. With luminous power to suit the particular application, high lighting quality and ergonomic handling, it provides optimum working conditions and is incomparable when it comes to adjusting to individual and task-related requirements. Great for workstations, labs, medical and industrial workbenches. 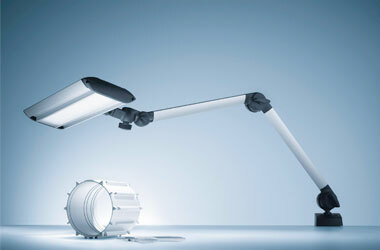 Maintenance-free LED technology with service life of up to 50,000 hours. Spring balanced arm assembly with 3D head joint. 30% energy saving on comparable fluorescent lighting. Dimming down to 10% lighting output. 5000K colour temperature (4000K available on request). Robust aluminium lamp head and arm. 3 models – 650, 1300 & 1950 lumen outputs. Optional wall bracket available (ML307). 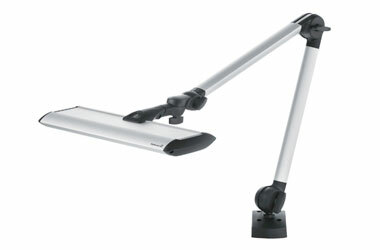 Taneo 24 watt, 1300 lumen, with bench clamp Buy Online!